I am broadly interested in most facets of ecology, but especially in the interaction between (i) individuality (behaviour and physiology) and fitness, and (ii) prey and predator. I study these interactions primarily in top avian predators, especially seabirds and birds of prey. My seabird work occurs primarily at two study sites, Coats Island and Middleton Island. Age plays a strong role in individuality both because some of what is called 'individuality' in wild animals may actually represent differences in either 'biological' or 'chronological' age and because variation in ageing trajectories may be the cause of much true individuality. I am particularly interested in the 'age-old' questions of why we age, why some animals age quicker than others, what causes ageing in wild animals and how physiological ageing causes variation in individual behaviour and fitness. Not long ago, senescence in animals was dismissed as an artifact of the lab as it was widely believed that few wild animals lived long enough to senesce. We now know that senescence is not only detectable in the wild, but up to 90% of mortality in very long-lived animals is associated with senescence. Yet we still have a poor understanding of the processes underlying senescence in the wild, how those processes cause variation in life-history and fitness, and how ageing processes occurring in the lab translate to the wild. Using two model systems both involving flying organisms, short-lived Drosophila and long-lived seabirds, I unravel some of these mysteries and provide insight into the evolutionary ecology of senescence in the wild. A comparative approach to such basic research may impact our ability to prolong the healthy lifespan of animals and to provide age-structured models for wildlife conservation. The impacts of climate warming are greatest in the Arctic. As the Earth warms, some Arctic biodiversity will be squeezed out. Top predators provide unique opportunities to assess changing ecosystems because they integrate information over many scales. As food for Northerners, they also provide early warning signals for human health. What does the changing ecology of Arctic wildlife tell us about ecosystems? How does reduced ice cover and increased pollution affect wildlife? I investigate these questions with the goal of better understanding the challenges associated with a changing Arctic so as to inform the environmental security of Northern communities. This study site is in the Gulf of Alaska and has been run by Scott Hatch (Institute for Seabird Research and Conservation) intermittently since the 1970s. In 1995, Scott adapted a design originally pioneered by John Coulson in England to fit an abandoned radar tower with ledges and one-way glass. Each year since then, a subset of birds have been supplementally fed capelin, and their reproductive success monitored. 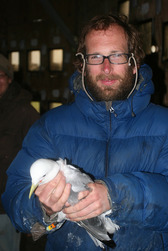 The site is a globally unique laboratory where individual wild black-legged kittiwakes have been monitored for two decades and can be studied in close proximity. For many individuals, we know their date of birth, their date of death, their partners, the date they started breeding each year, how many offspring they produced each year, and how fast their offspring grew. Apart from the kittiwakes, a couple of dozen pairs of pelagic cormorants nest on the towers and can be studied via the same one-way glass windows. Tufted puffins, rhinoceros auklets, common murres, tree swallows, glaucous-winged gulls and a number of other species also occur on the island, and are studied in varying degrees of depth. A photo album from various visits to Middleton is available here. Both Tim Van Nus (here) and Mike Johns (here) have blogged about their experiences on the island. A banded kittiwake captured for biologging. 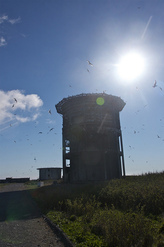 An abandoned radar tower Scott has turned into the world's best kittiwake lab. 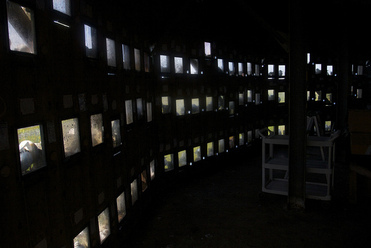 A view inside the tower where roughly 500 pairs of kittiwakes nest behind one-way glass, facilitating studies of behaviour, physiology and demography. 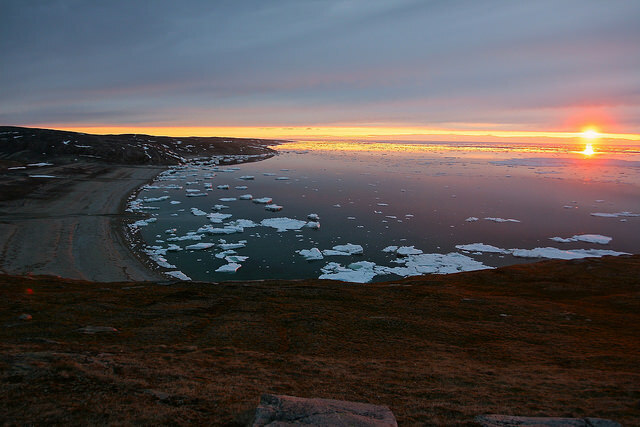 This study site is in northern Hudson Bay, Nunavut, and has been run by Tony Gaston (Environment Canada) since 1981. Following Tony's retirement in 2014, Grant Gilchrist and I are running the seabird camp on Coats Island. With the exception of 1982, 1983, 2012 and 2014, the thick-billed murre colony has been visited each year to record the timing of breeding, reproductive success and diet of individual murres on study plots. The site is unique in Canada as the only site where the reproductive history of individual non-passerine birds has been followed for over three decades. Coats Island was also the original site where Don Croll first measured the diving behaviour of any auk, and the team has compiled one of the best long-term datasets of the dietary preferences and energy intake, as well as the foraging behaviour and energy expenditure, of individual wild predators. A photo album from various visits to Coats is here. View out from our cabin. 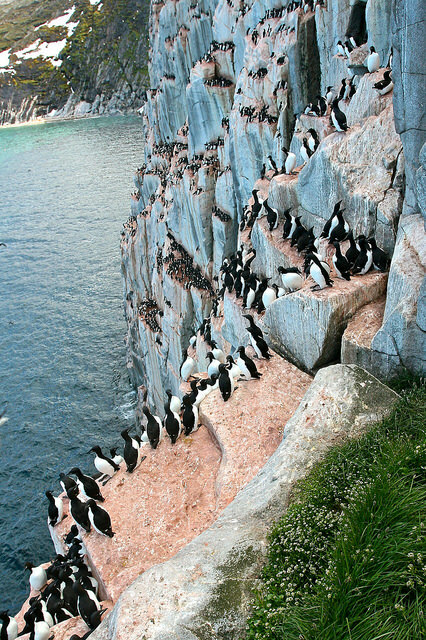 The Coats Island murre colony as seen from the 'S' ledge. 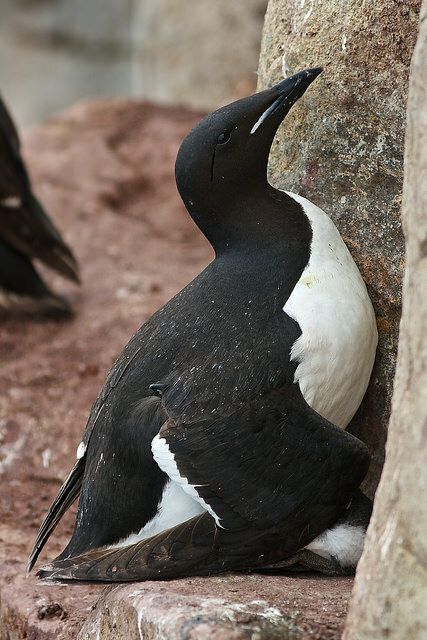 An alpa (its Inuit name; known to scientists as 'thick-billed murres' or 'Uria lomvia') protects its twelve day old chick.